Click to see full size. From Funders and Founders. On a recent call in a group coaching program I'm part of, our coach used the graphic to the left as the topic of discussion. 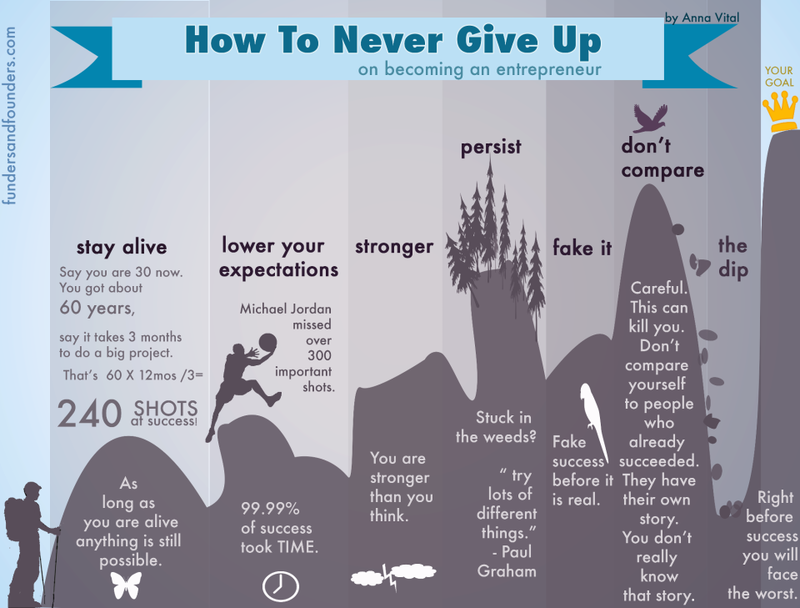 As an entrepreneur, I could relate to everything in the graphic and how resiliency is a hallmark of successful entrepreneurs. If every setback makes you feel like quitting, then you're not cut out to be an entrepreneur! 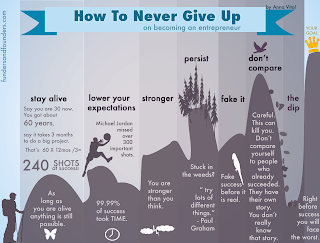 I found that the concepts in this graphic also happen to apply to speakers, so I'm going to share my thoughts with you on resiliency and "not giving up" for speakers. The graphic says, "As long as you are alive, anything is still possible." This goes for those of you who tell me, "I'm going to bore the audience," or "I'm never going to feel confident onstage," or "I always forget what I wanted to say," and a million other similar statements of defeat. As long as you are alive, anything is possible. Every time you get on stage, you have the opportunity to prove yourself wrong! Every time you get on stage, you have another opportunity to improve as a speaker. Of course, if you don't get on stage, none of these opportunities present themselves, so you have to actually get the speaking engagements on your calendar in order to learn and grow from them. But there's no reason to give up. You have all the time in the world! The graphic says, "99.99% of success took TIME." Once you start getting those speaking engagements and making them happen, you still have work to do. You still have to practice, you still have to revise and refine your content, you still have to figure out what works with your audiences. Getting better as a speaker takes time. It takes work. If you're willing to put in the time and do the work, you will improve. You might even become great! The graphic says, "You are stronger than you think." So many fears and anxiety come from the "what ifs" of speaking. What if I lose my place? What if I tell a joke and it's not funny? What if I can't remember what I was going to say? What if I can't answer their questions? Guess what: Those things will happen. Every single one of them. And more. And you'll survive. You'll move on. You'll even laugh about it later. None of those things is the end of the world and, in fact, every single person in your audience has had the same experience, so they can empathize. And if they haven't had the same experience, it's because they haven't put themselves out there in the world like you have. But they'll at least sympathize, so don't worry. The graphic says, "Try lots of different things." Every audience is different, and sometimes you'll find that one audience responds really well to a story or an activity, but another doesn't. That's okay. Keep trying new things. If something works well for most audiences, keep it, but remember that every audience has its own culture, and sometimes things just don't resonate. That doesn't mean it's wrong, it's just wrong for that audience. Keep tweaking and adjusting so every audience has the best experience you can give them. The graphic says, "Fake success before it's real." As a speaker, whether or not you feel strong, powerful, confident or ready, you have to get on that stage and deliver. Look confident on the outside with good posture, good eye contact, a well-projecting voice and purposeful movement, and the audience will perceive your confidence, even if you're not quite there yet on the inside. The good thing about faking it is that your inside will likely follow along until you're not even faking it any more. The graphic says, "Right before success, you will face the worst." I think we all agree that sometimes something has to go really wrong before we're willing to take action to fix it. You can be gliding along, giving the same canned presentation to lukewarm audiences for a long time. But one of those audiences is going to rebel. You're going to get bad evaluations or you're going to face challenges from audience members. Something will happen that rocks your world and makes you feel really bad. We've all been there. Learn from it. Take it as a sign that it's time to up your game. Don't dwell on it or let it bring you down (well - you can dwell on it for a day, but then move on). Make a commitment to excellence. Give your presentations the time, focus and care that your audience deserves. How do you interpret the messages on the graphic as they apply to speakers? Share in the comments! Lisa, I can relate to much of what you've said here. I especially like two points: What works for one audience might not work for another. Sometimes I think I've said something really funny and the audience is still while with other audiences I get a good laugh. Doesn't mean I'm going to stop working on my humor with audiences. It's good feedback. I also like that we will make mistakes and things will go wrong. That's a metaphor for life. We push through though when we want it bad enough. If we really are committed to our speaking we'll accept the inevitable less than excellent speeches, jokes that fall with a thud, or microphone mishaps and keep coming back to the stage. Nice work in tying speaking together with the graphic. Enjoyed this post! I love this, Michael: "We push through though when we want it bad enough." That says it all!